The reason that have said that it is slightly different is because unlike some other balms that I have used, this balm isn’t solid when it’s in the jar, Mariner Jack balm is slightly soft and therefore easier to work with, especially in this weather. Mariner Jack create the finest beard oils and beard balms. We use only the finest quality, natural ingredients sourced from around the World. Crafted by hand, using a unique blend of argan, jojoba, sweet almond and vitamin E oils. Beard balm not only deeply conditions the hair and skin, it contains organic unrefined shea butter to increase the density of your beard. It also provides a light hold with the addition of a small amount of organic beeswax. Both leave your beard soft, manageable and healthy. Its a 60ml jar unlike the others that I have used that’s exactly been tinned, my jar has a black lid unlike the photo above. I don’t like my beard to be set as if have applied hairspray and Mariner Jack Beard Balm leaves my beard soft and you don’t need a lot on your beard, I like an Unscented balm because I like to add a little balm and then some oil and that way I don’t have to worry about mixing scents. 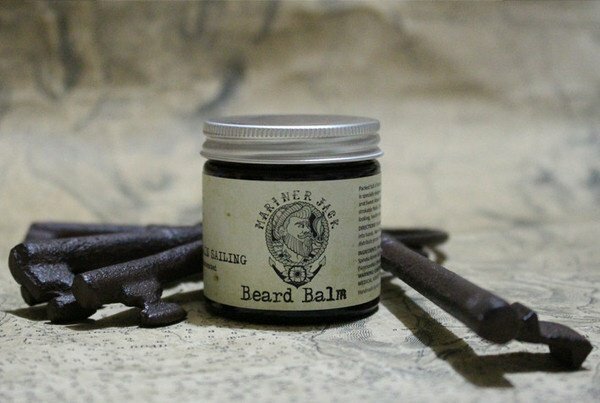 Anchor beard balm – that is frankincense, black pepper and ylang scented. Mariner Jack Beard Balm is definitely worth considering if you are looking for a beard balm, it doesn’t leave my beard greasy (remember a lot goes a long way) and keeps my beard in good condition. Mariner Jack also sell beard oil in the above scents but I have only tried the Plain Sailing Balm and so cannot comment on the other products. ← I managed an outing, well sort of! Looking for a new beard balm and am very interested in the tortuga scent. Thanks for the reviews on here that’s probably what I’m going for.